Let’s not kid ourselves: no matter how much you love your job, there will always, always be days where the last thing you want to do is force yourself out of your nice warm bed and head in to work. However, there’s a good chance that the frequency of days like these will be substantially decreased if your place of work offers an environment so appealing you would actually choose to be there even if you weren’t getting paid. Obviously, employers have been catching onto this fact more and more in recent years, hence the flood of “fun” Google-style offices with free cupcakes, slides instead of stairs and of course – the office classic – foosball tables galore. 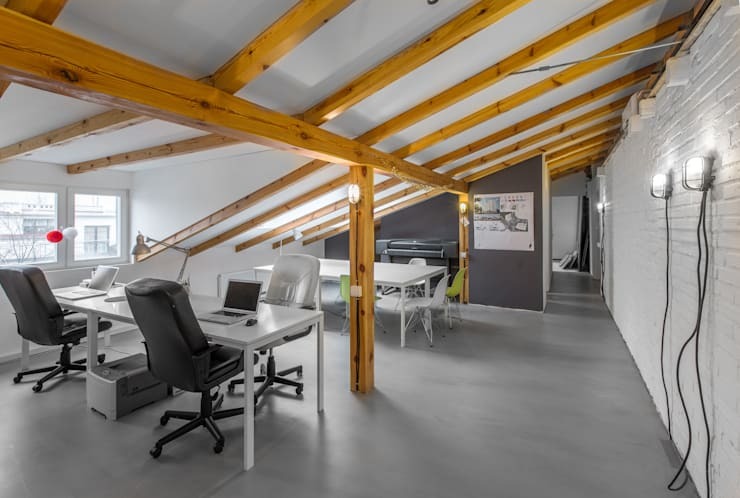 The offices in this ideabook may not provide any of those things, or at least not visibly, but they do provide something else that is just as conducive to happy and productive staff: beautiful, well-designed working environments without a depressing grey cubicle in sight. It makes perfect sense that a company that strives to achieve grand things should situate itself in appropriately grand surroundings. With its high ceilings, old-school wallpaper, gorgeous plaster mouldings and truly ostentatious chandelier, this room may seem more suited to being a ballroom than to being an office. But it’s easily imaginable that working in such a splendid environment would boost creativity and lead to some very out-there ideas and innovations. This is an office that would certainly encourage staff to aspire to greatness. Where the charm of the previous room lies in its almost overwrought splendour, the charm of this lovely office lies in its simplicity. The key features here are the beams and the irregularly sloping roof they help support. The painted white brickwork of the wall on the right-hand side maintains the minimalist feel, while adding a little textural diversity to the area. Although the windows are not especially large, the broad expanses of white space result in a sense of cleanness and brightness throughout the whole space. The low lighting and exposed brickwork of this office space contribute heavily to creating an intimate and warm atmosphere. This is enhanced through the addition of items usually associated with a domestic environment rather than a corporate one, such as the rug seen beneath the table and the cat-shaped knickknacks lined up against the wall. The window through to the next room allows a visual connection between co-workers without resorting to the all-glass layouts that can often render contemporary offices so soulless. Not one item of the furniture in this office could actually be identified as typical office furniture, seen in any other context. And yet seen all together, as here, it is clear that these individual pieces do collectively form an office. Just as in the previous image, we see here how introducing a touch of the personal to a work environment can immediately dispel any sense of corporate coldness. 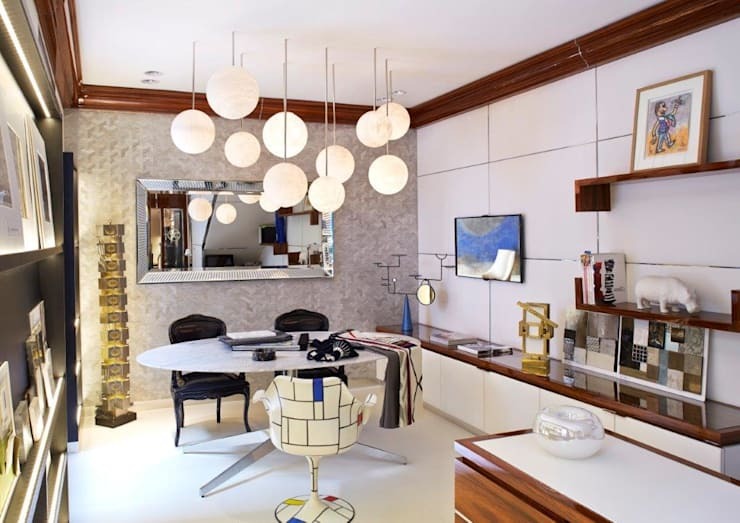 There’s a lot to love about this little room, from the fabulous lighting design to the friendly little hippo on the shelf to – perhaps most strikingly – the Mondrian-inspired reimagining of a the typically dull swivel chair. This is another example of an office where the choice of lighting has had a significant effect on the overall energy of the room. The furniture here has been beautifully selected, and it’s clear a lot of thought has gone into avoiding easy office options. However what really brings the room together and makes it feel that bit less impersonal is the woven lampshade used throughout and seen most clearly in the foreground. This unexpected, highly quirky piece adds character and breaks up the minimalist uniformity of the rest of the space. For more creative office ideas, read our tips for decorating a work office. 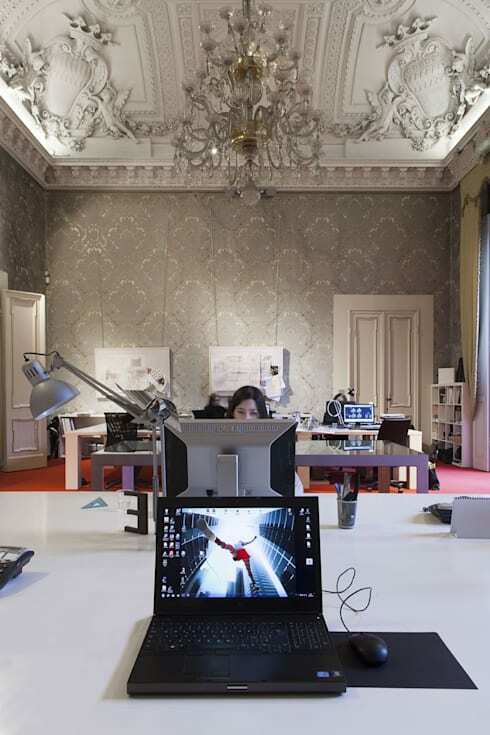 Is your office grey or great? Would you rather work in one of these rooms, and if so, which?